Help : Where is SQL Server ErrorLog? While helping unknown faces via MSDN SQL Server Forum, I have asked many times to share the “SQL Server ErrorLog”. Most of the time, I need to explain where the ErrorLog(s) are located. so this post is to help those who are new to SQL Server. Well, if you ever call Microsoft SQL Support for any problem with SQL, they (including me) would ask SQL ErrorLog. 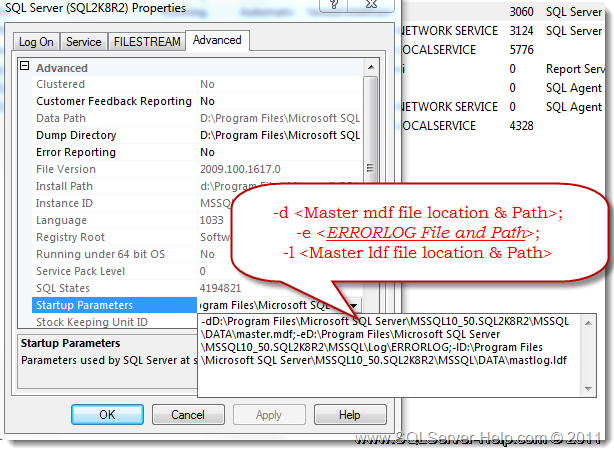 SQL Server maintains its own error logs that contain messages describing informational and error events. I personally don’t like name of the file “ErrorLog” as this file does not contains only errors, it also contains information messages. This is the reason we have added additional text in information message called “This is an informational message only. No user action is required”. 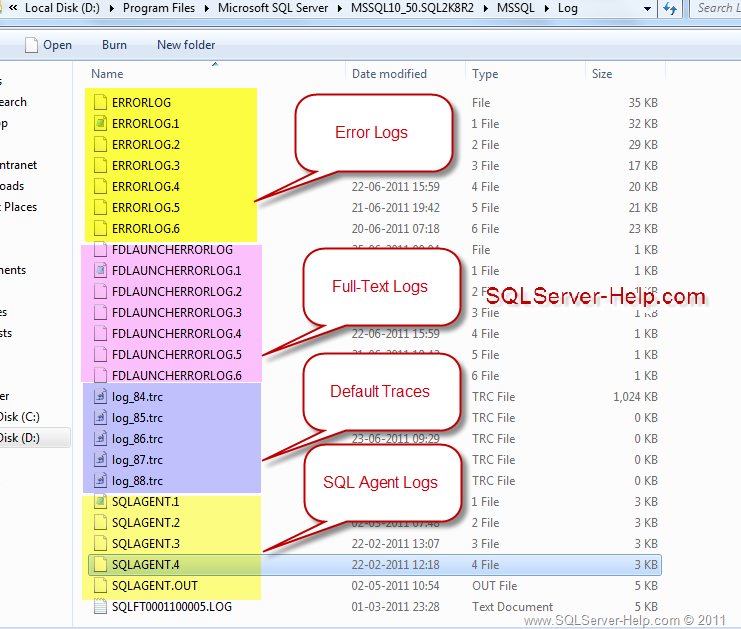 If you look at folder D:\Program Files\Microsoft SQL Server\MSSQL10_50.SQL2K8R2\MSSQL\Log\ here are files. As you can see above that LOG folder contains many files. I have provided little information about them in picture. There could be situations where you are not able to connect to SQL Server because SQL Server service is not getting started. In those situations, sp_readerrorlog can’t be run. Now, we have to find ERRORLOG file using other technique. Here we go. Help : How can I hide databases from users? This is one of the common questions I have seen on forums, most common request from administrators who have been given task to create multi-tenant SQL Server. This essentially means various department of company or various client of the hosting company would access same SQL Server Instance. Business owners demand that they want clients to see only those databases which are relevant for them. I have worked with a company where the database name was name of the client. Inability to hide name of databases would essentially mean exposing information about their other clients. In simple words, if Contoso is a database hosting company who has “Northwind traders” and “TailSpin Toys” as their client. If TailSpin logs in to the SQL Server, they should not see “Northwind” database and vice versa. So, here is the quick script which can be used to demo this. If you love SSMS then I have also given instruction. NorthWindLogin can see only NorthWindDB database and TailSpinLogin can see only his database. Erland Sommarskog, SQL MVP, has filed request “Need VIEW DEFINITION permissions per database”. If you feel this is useful then please vote here! Help : What’s my SQL Server Name? Let’s look closely at the error message. 1. The server was not found or was not accessible. 2. Verify that the instance name is correct and that SQL Server is configured to allow remote connections. 3. error: 26 – Error Locating Server/Instance Specified. All of the above are shouting out loud that “Damn! you have given wrong name to connect”. If you have given right name then check if SQL is up and running and then whole troubleshooting starts. The purpose of this post is to help the beginners who don’t care about troubleshooting because they are Visual Studio developers and they are connecting to local SQL Express most of the time. Open SQL Server Configuration Manager (SSCM) from Start – > All Programs -> Microsoft SQL Server 2005/2008/2008 R2 -> Configuration Tools. The InstanceName is what we need to find, instance name. If you install multiple instances on the server, you will see more than one SQL Server (InstanceName) listed. 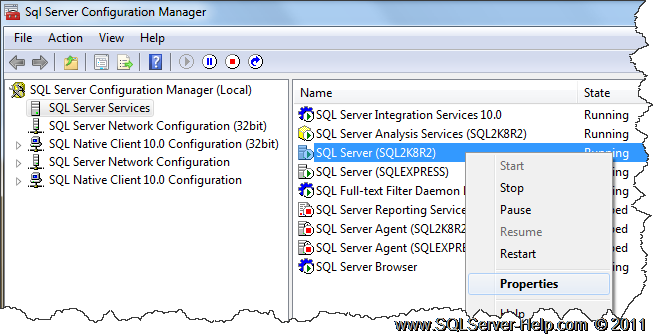 In above picture you can see two “SQL Server” in “Service Type” column. It means I have two instances of SQL Server. For default instance you would see Name as SQL Server (MSSQLServer). It means on my machine I have two “named” instances of SQL Server. Keep in mind that you can have only only default instance on a machine. Okay great! Now you know that your machine has default instance or named instance. And if it’s named then you know its name. Correct? Now lets quickly see what name you should use to connect. Before that you need to find hostname or computer name. Go to Start > Run > cmd This would open command prompt. Type hostname and you should see your machine name as below. BLAKHANI\SQL2K8R2 this would work from remote machine also. TCP:221.222.223.224,1433 TCP:221.222.223.224,9999 IP and Port can be found by reading ERRORLOG of SQL Server.